Stack up the savings at Easy Spirit online during Columbus Weekend Sale! 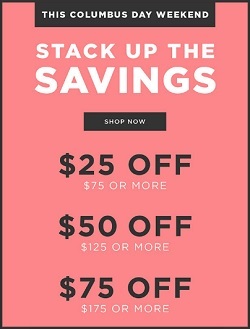 Spend $75 or more and save $25 off your purchase. Spend $125 or more and save $50 off your purchase. Spend $175 or more and save $75 off your purchase. Source of the information is Easy Spirit. The offer is valid until October 10, 2016. For more information visit Easy Spirit online right now.